Turning the Levels up a notch!!! These shows bout to be lit🔥🔥🔥🔥 you don't wanna miss this!!! A$AP Ferg and Tory Lanez are hitting the road soon, and now they'll have a song to perform together. "Line Up The Flex" is produced by Play Picasso; the track reportedly came together last month during SXSW. 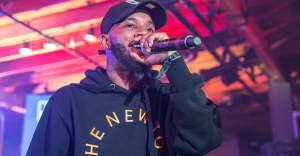 "I had no intentions of letting you down," Lanez wrote on Twitter. Listen below, and check out the pair's tour dates here.